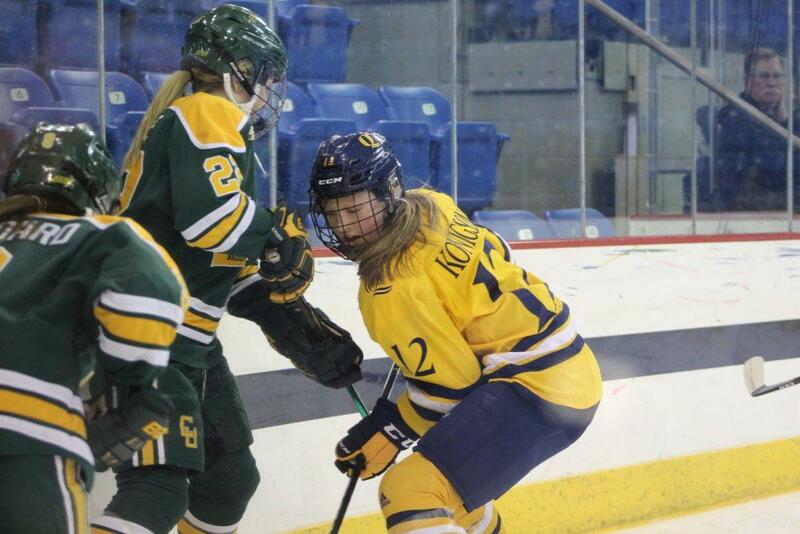 The Quinnipiac Bobcats women’s ice hockey team (9-16-3, 6-9-1 ECAC Hockey) could not complete the comeback against the St. Lawrence Saints (13-12-3, 8-6-2 ECAC Hockey) as the team lost by a score of 5-4 on Saturday at home in People’s United Center. The Bobcats did however, outshoot the Saints 44-20. The Bobcats also won more faceoffs than the Saints, 44-28. The Bobcats also were less mistake-heavy, as they only committed two penalties to the Saints four. However, the Bobcats could not keep up with the scoring efficiency of the Saints. There were two major reasons for the Bobcats coming up on the short end. The first was junior goaltender Abbie Ives did not come and perform. The night before, Ives had 22 saves on 25 shots, with three goals allowed. However, on Saturday she only had 15 saves on 20 shots while allowing five pucks behind her. “I believe in Abbie,” Turner said. “She’s a great goaltender and I want people to grow through moments like that”. The other reason the Bobcats could not win on Saturday was inefficient scoring. The Bobcats did finish the night with four goals, however for most of the night they could not finish, with only two goals into the third period. There were many wide open attempts for the Bobcats around the net, but they just could not convert. Also the Saints’ senior goaltender Grace Harrison had herself a night as well with 40 saves. Even with those two outlying factors leading to the loss, the Bobcats almost came back and could have sent the game to overtime. Into the third period, the score was 5-2. The Bobcats did make it a 5-3 game after senior center Randi Marcon scored with almost five minutes left during a power play. The Bobcats proceeded to pull their goaltender to have a skater advantage over the Saints. The Bobcats then kept fighting to keep the puck on the offensive end. They would end up mustering a goal in to make the score 5-4 scored by freshman center Lexi Adzija, but it was too little, too late as there were only two seconds left in the game. “I think we were a little too slow to start the third period,” Turner said. “Once we realized how they were going to play and dump pucks in, we started to pressure them and play faster. To get 18 shots on net to their three in third period is really important for our team as we move into this week”. The Quinnipiac Bobcats will look to change fortunes in their next game as they will play guest to the Yale Bulldogs (7-15-1, 6-9-1 ECAC Hockey) in New Haven, Connecticut on Friday, Feb. 8 at 6 p.m.